We offer the best quality of Steam Generators to Our Client. - SG (Steam Generator) is a complete system that delivers high temperature, saturated steam at a constant pressure to exercise a particularly effective cleaning and disinfecting action. - OUTER BODY galvanized & hot painted. 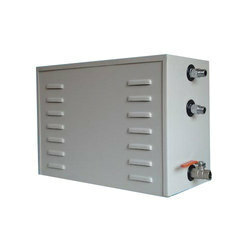 - Water storage tank, water injection pump & electric control panel. - Elegant design sturdy Construction. Long rust free life. All mountings and electrical easily accessible. BHEL HRSGs - World class modular technology: BHEL manufactures and supplies a wide range of modular-design HRSGs for waste heat recovery applications, with technology back-up from Vogt-Nem, USA. A steam room is essentially a composite glass enclosure, where modern implements for water deliverance are assembled together with attractive lighting, complemented by optional audio entertainment and a device for steam generation. Steam Generators operate on electricity. These steam generators have timers and a control panel and are built to operate in closed enclosures.